IFR/Static Certification: June 2013. Next due June 2015. -STEC Altitude Alerter: Auto level off a preset altitude. Alarms prior to altitude capture and decision altitude. Both of these $35,000 installed. -Garmin 530 WAAS GPS, Nav, Comm, moving map, provides glide-slope on GPS approach down to 200' AGL where applicable. -Ryan 9900 Active TCAS (traffic): Displays on 530 and Ryan display. -Davtron Digital OAT, volts, press alt., density alt. -Osborne Aluminum Tip Tanks: 40 gallons extra fuel. Total fuel quantity: 114 gallons usable (684lbs). 180lb gross weight increase with these tip tanks. Paint is all over Materhorn white with blue and light brown strips in very good condition. Rated 7+ to an 8 out of 10. Interior is also very good with high quality leather seats. There is one blotch on one of the seats about 1in by 3in. Don't know what caused this. There are also some plastic cracks, especially in-between the middle seats on the floor level from taking these seats in and out. Not very noticeable. Rated 7+ to an 8 out of 10. Glass is in good condition. 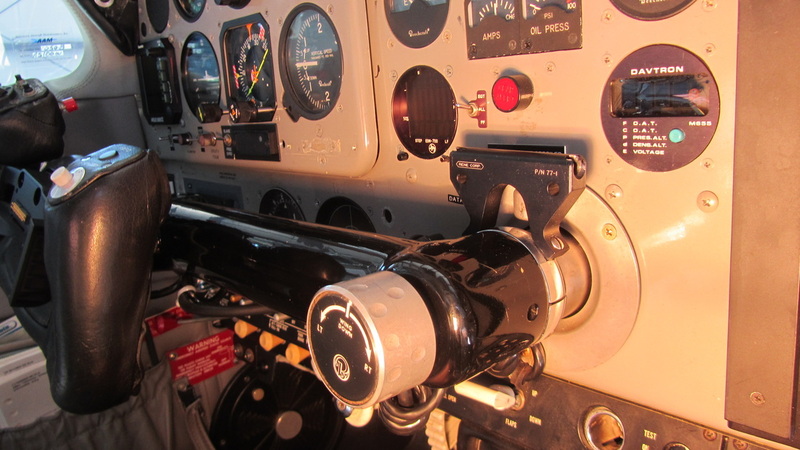 This A36 has had a very good history with the exception of a gear up landing in 1980. There is no sign of the repair and no problems after this incident. The maintenance history and logbooks are also very good. The right fuel gauge seems to stay around full until the tank is about half empty, when it then drops and reads accurately after that. 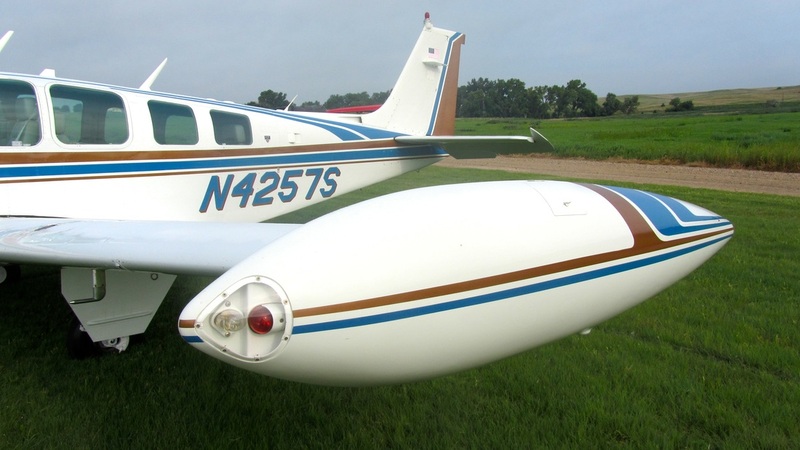 The avionics in this Bonanza are worth half the price of the airplane. It flies a GPS approach to 200ft AGL hands off. 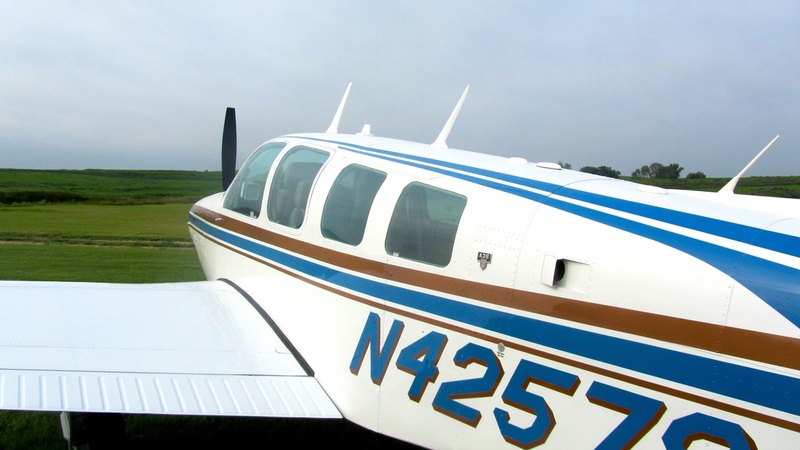 The two blade prop lacks climb performance to the three blade prop, but it makes it up in cruise performance. It cruises about 3-5kts faster than the three blade and climbs about 20% less than the three blade. At 8,000-9,000ft MSL it trues out at 167kts on 13gph.